Hynek Rybnicek (pronounced rib ne check) was Mandan's self proclaimed "biggest --- chiseler." He was born in Brezi, Bohemia on April 16, 1887 to Marie Smelana and Josef Rybnicek who eventualy reared a family which included seven sons and two daughters. Both Hynek's father and grandfather were stonecutters. 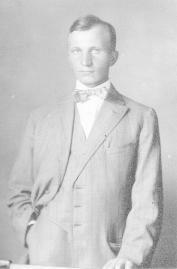 In 1906 at age 19, Rybnicek immigrated to the US to avoid conscription in the army like many other Europeans. He and his brother Anton arrived in Baltimore. Hynek Rybnicek moved to the Cleveland, Ohio and lived for a time with relatives in the Bohemian settlement there, but "They really didn't want us - afraid we could not pay for our keep," he said in a 1965 interview. So he struck out west, floating around a while as a farm laborer in Kansas, Illinois, Omaha Nebraska and Minnesota. His craft went unused until he answered an ad for a stonecutter in 1908 for Bismarck's Marble and Granite Works (now Bismarck Memorial Co.). 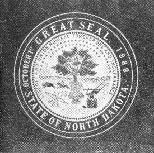 He also established his own farm homestead in Morton County. He attributed his difficulty securing a stone cutting job because of a unique attitude. He reported that Americans kept reminding him that "in the United States, you do things that your father didn't do in the old country." He became a naturalized citizen of the United States of America on September 18, 1914. Czechoslovakian girls frequently came to the United States and worked for Czech families while they learned English. A girl who grew up in Zaluzi, Bohemia, a village near Hynek's hometown, moved to Cleveland. Antonie Mendik and Rybnicek at one point began to exchange letters. "Toni" was an accomplished seamstress and cook. In 1914 financed by a $200 bank loan, Hynek traveled to Cleveland to marry Antonie on January 7, 1915 in the Bohemian National Church, Our Lady of Lourdes. The couple returned to the area by train to settle down and start a family. He split his time between working in Bismarck and developing his homestead. 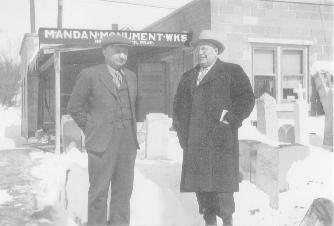 At the urging of his bride he started his own business, Mandan Monument Works. 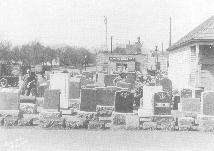 On July 27, 1915, he set up his shop at 522 West Main St. Area farmers would frequently select a fieldstone on their property and engage Rybnicek to carve their gravestone. The practice served to cut material costs, important during the Great Depression era. But he claimed the most pride for his work at the North Dakota Peace Garden, namely the Canadian-American Young Citizen's monument. Sponsored by the Young Citizens League of ND, the 1950 mahogany granite marker was paid for by donated pennies from the state's school children. He also attributed its inscription as being the most sincere of all "Under God Let Child Love Child and Strife Will Cease." Rybnicek also carved the stone marking the America Elm tree also donated by the Young Citizens League and placed on the State Capitol grounds. But history will most remember the craftsman for his work on North Dakota's contribution to the Washington Memorial in our nation's capital, and the final cornerstone in our state's Capitol. 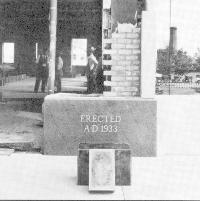 In 1933, Hynek returned to his practice of using native North Dakota fieldstone when he was recommended by Governor (and former Mandan resident) George Schafer to carve the cornerstone for the new State Capitol building. However this approach was for historical significance rather than cost. Rybnicek credited this work as his most difficult challenge as it had to be fabricated to fit an existing opening late in the project's construction. 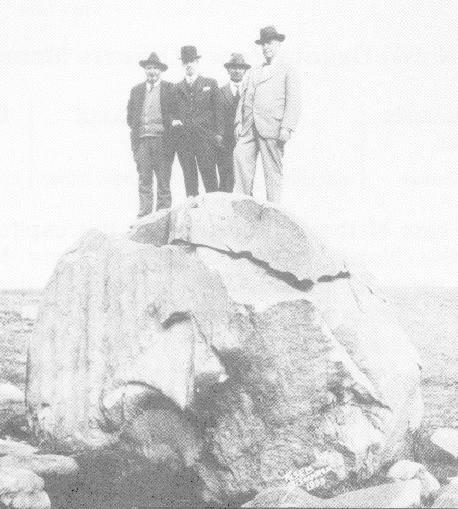 The gigantic boulder moved from Canada and deposited in Morton County was used by Hynek Rybincek to carve out what would eventually become the final cornerstone for the current ND State Capitol Building. A copper-lined box was inserted within the cornerstone and filled with various historical artifacts. Pictured to the right are William Dobsen, capital groundsman; Joseph Bell DeRemer, architect; Hynek Rybnicek, stonecutter; and Ernst Warner, Capitol Commission. In addition to his stone-cutting business, he raised small grains on their 560 acre farmstead 15 miles west of St. Anthony. Hynek was a avid game-bird hunter and made it a family based event. But as he grew older, he reclaimed his childhood love for reading and focused on the bible. Rybnicek's lived in Mandan at 710 Fifth Ave NW. Hynek finally closed his shop as he approached his 82nd birthday. He died on May 24, 1971. His wife Antonie had died over 20 years previously on August 4, 1947. Their son Ervin Hynek, born on October 16, 1917, made 1st lieutenant in the US Army in World War II but was killed in action on Okinawa in the Pacific Theater on April 2, 1945. All three are buried in Union Cemetery, Mandan, ND. Their daughter Libuse married Albert Imbrone of St. Paul and lived there with her husband and their five children. Her brother also had one child, a son, who would be a grandson to Hynek Rybnicek. The Society would like to thank MHSoc lifetime member Libuse [Rybnicek] Imbrone for sharing this information on her father with us.